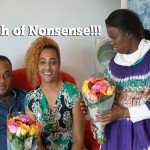 Why anyone would get it in their heads to bring a bunch of flowers to a sick Udoh is something Affiong can not understand. If Udoh is sick you bring pepper soup and not a bunch of nonsense! Welcome to the world according to Affiong!